AFTER such an exhilarating 1987-88 season, Liverpool were hot favourites to retain the title they won in style, especially as they had re-signed striker Ian Rush from Juventus. Arsenal, who had finished sixth, were seen as a team that could chase the eventual champions, but not seriously challenge for top spot. Their success in 1988-89 was a tribute to the talent of their young players, many of which had come through the ranks at Highbury. Furthermore, they also pulled off an unlikely victory in theatrical style in the season’s final game at the home of the reigning champions. The early-season pacesetter was not Arsenal or Liverpool, however, but none other than Norwich City, who sat on top of the championship table until the turn of the year. Arsenal had started the season well, with a 5-1 win at Wimbledon but were ahead of the pack behind the East Anglians. Arsenal’s away form was notable in the early months of the season, securing impressive wins at West Ham, Tottenham and Nottingham Forest. Arsenal had gone into the campaign with no major signings, but had unloaded Kenny Sansom and Steve Williams to Newcastle United and Luton Town respectively. Players like Alan Smith and Brian Marwood had been bedded-in during 1987-88 and youngsters David Rocastle, Tony Adams and Paul Merson were all establishing themselves as first team regulars. Manager George Graham has also signed two new full backs over the previous two seasons, Lee Dixon and Nigel Winterburn. Arsenal hit the top spot after a Boxing Day win at Charlton Athletic, the second victory in a five-match winning run. By mid-February, the sceptics were saying the pressure was getting too much for Arsenal’s young team. Tepid draws against Queens Park Rangers, Millwall and Charlton, along with a 3-1 home defeat at the hands of Nottingham Forest added fuel to this argument, but Arsenal regained their confidence and four wins, each accompanied by a clean sheet, put the title challenge back on track. Liverpool had also rediscovered their verve, but in April, the club was involved in the Hillsborough tragedy and it is arguable that this undoubtedly affected the players and side-tracked the title bid. Regardless, Liverpool appeared to have gained the initiative in the final weeks of the campaign. Arsenal dropped five points at home, losing 2-1 to Derby and then drawing 2-2 with Wimbledon. Liverpool, meanwhile, extended their unbeaten league run to 24 games and went into the last game in first place with a three point margin over Arsenal. 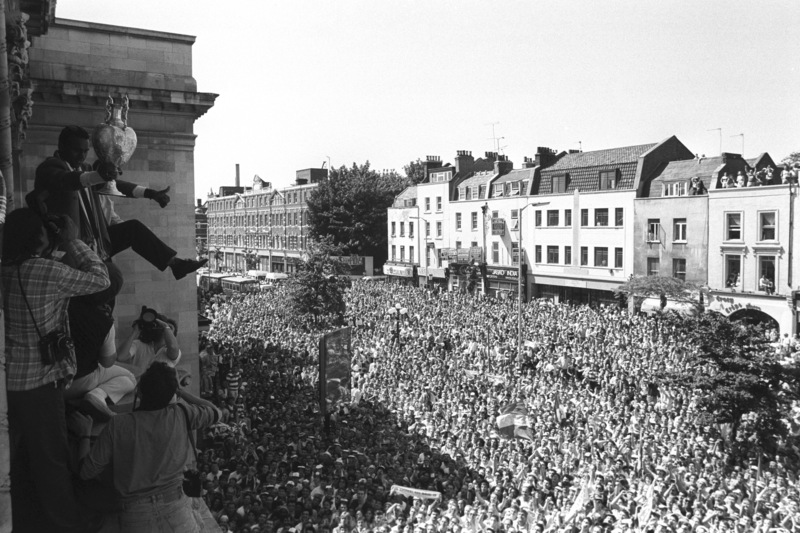 George Graham’s team needed to win 2-0 to clinch the title. Liverpool had already won the FA Cup in the second all-Mersey final in four years, so the “double” was a possibility, which would make the Reds the first team to achieve that feat twice. The game was screened live on TV, giving the title decider the air of a cup final. Alan Smith scored Arsenal’s opening goal after half-time and despite the efforts of the Londoners, it looked as though Liverpool would hang on to win the championship. But in the final throes of the season, Lee Dixon’s long ball was knocked on by Smith and Michael Thomas ran on to score. It was a stunning finale and one that destroyed the air of invincibility that had existed around Liverpool’s home ground for many years. Both teams ended on 76 points and with a positive goal difference of 37, but Arsenal were champions by virtue of scoring more goals. It is doubtful there has ever been a more dramatic end to a championship race and for Liverpool it almost spelled the end of an era. For the neutral, it signalled change after a period of Merseyside dominance that stretched back to the mid-1970s. Arsenal’s team in 1998-89: John Lukic; Lee Dixon, Nigel Winterburn, David O’Leary, Tony Adams, Steve Bould; Paul Davis, Michael Thomas, David Rocastle, Brian Marwood, Kevin Richardson; Perry Groves, Paul Merson, Alan Smith, Martin Hayes. John Lukic (27) Born in Chesterfield of Yugoslav parentage, Lukic was signed from Leeds United in July 1983 for £ 75,000. A dependable keeper who returned to Leeds in 1990 and went on to win a second title with the Yorkshire club. Lee Dixon (24) Arrived at Arsenal in January 1988 from Stoke City after earlier playing for Burnley, Chester and Bury. Good going forward and linking-up with forwards and midfielders, Dixon went on to win 22 England caps and played over 600 games for Arsenal before retiring at the age of 38 in 2002. Nigel Winterburn (24) Left-footed full back who joined Arsenal in the summer of 1987 from Wimbledon, costing the club £ 350,000. Began his career with Birmingham and Oxford before joining Wimbledon in 1983. Won two England caps and played over 400 league games for Arsenal, leaving the club in 2000 to join West Ham United. Tony Adams (22) Romford-born central defender who captained Arsenal for 14 years from the age of 21. In a one-club career, he played 669 times for Arsenal, scoring 48 times. He was capped 66 times by England and also captained his country. After revealing publically that he had addiction problems, Adams’ career was revitalised by manager Arsene Wenger and he went on to play for the club until 2002, retiring at the age of 35. Steve Bould (25) Joined Arsenal in 1988 from Stoke City, his home town club, for a fee of £ 390,000. A tall, commanding central defender, he won two caps for England and became a trusted member of the Wenger set-up several years later. Played more than 300 league games for Arsenal. David O’Leary (30) Centre half who played 722 first team games for Arsenal in a career that saw him make his debut in 1975 and finally stop playing in 1993. An Irish international, 68 caps, he played in the 1990 World Cup and scored a vital penalty in a shoot-out that has since been voted the greatest moment in Irish football history. Brian Marwood (28) Experienced winger who joined Arsenal from Sheffield Wednesday in March 1988. Won one England cap. Injuries prevented him from playing a full part in 1988-89. Left Arsenal in 1990 to join Sheffield United. Michael Thomas (20) London-born midfielder who came through the Arsenal youth scheme and made his debut in 1984. Scored the vital goal that won the 1989 championship, but within two years, was sold to Liverpool and his career went into something of an anti-climax. Won two England caps. Later played for Benfica and Wimbledon. David Rocastle (21) South Londoner who was one of Arsenal’s outstanding home-grown products in the 1980s. Nicknamed “Rocky”, he was popular with the Arsenal crowd and when he was sold in 1992 many were upset that the club dispensed with his services. He had played 228 league games for the Gunners. Rocastle was sold to Leeds United for £ 2 million and his career went downhill from there, latterly playing for Manchester City and Chelsea. He won 14 caps for England. Tragically died at the age of 33 in 2001. Named in PFA team of the year for 1988-89. Paul Davis (26) Left-footed midfielder who made his debut for the club in 1980. Made over 400 league appearances for Arsenal, despite falling-out with manager George Graham, before joining Brentford in 1995 on a free transfer. Kevin Richardson (25) Energetic midfielder who won his second league championship with Arsenal after playing a part in Everton’s success in 1985. Moved to Watford in 1987 but spent just one season with the Hertfordshire club before joining Arsenal for £ 200,000. Failed to get on with George Graham and moved to Real Sociedad in 1990. Won one England cap. Martin Hayes (22) Winger who won a medal in 1988-89 despite playing a cameo role in the title campaign. A product of the Arsenal youth system, he left the club in 1990 to join Celtic. Paul Merson (20) Right winger who graduated through the club’s youth system and played a key role in the 1988-89 season. He won 21 England caps and played in the 1998 World Cup, although as a Middlesbrough player, the club he joined in 1997 from Arsenal. He played more than 400 games for the Gunners, scoring almost a century of goals. Named PFA Young Player of the Year in 1988-89. Perry Groves (23) London-born winger who was signed from Colchester United in 1986 for £ 50,000, becoming George Graham’s first signing for Arsenal. Stayed with the club until 1992 when he joined Southampton. Alan Smith (25) Tall centre forward who joined Arsenal in 1987 from Leicester for a fee of £ 800,000. Good in the air, he was also adept at holding the ball up and laying off to team-mates. Started his career with non-league Alvechurch and moved to Leicester in 1982 where he scored 76 goals in 200 league games. At Arsenal, he played 347 games and scored 115 goals. Won 13 England caps, scoring twice. Named in PFA team of the year in 1988-89. Using just 15 players all season was the norm for a title-winning team in those days. I don’t think Liverpool ever used more than that in their heyday.